Check out the latest Aaron Brothers ad and sales flyer. Aaron Brothers weekly ad is simple, easy to use and can save you money. Find the latest weekly specials, coupons, deals, sales and offers for: Custom Framing Summit Collection; Photo Frames & Albums; Steinbeck & Metropolitan Frames; Lisbon Frames; Hampton Frames; Photo Boxes; Pacifica, High Tide, Alluvial & Nantucket Frames; Poster Frames; Canvas Art; Heavy Duty Canvas; Open Stock Brushes; Paper Pads; Melissa & Doug; Outdoor Toys; Pencil & Erasers; Creativity for Kids; and more. Aaron Brothers stores activate their latest weekly ad on Sunday. Aaron Brothers was built on the idea of being your neighborhood store for true artistic expression. 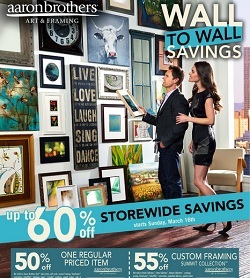 The stores offer an exciting mix of merchandise and inspiration to create, display and capture memories with framing. Aaron Brothers certified designers are trained to provide expert design and preservation advice in stores – free of charge. Today, you can see your artwork finished with your frame selection before you ever place your order.